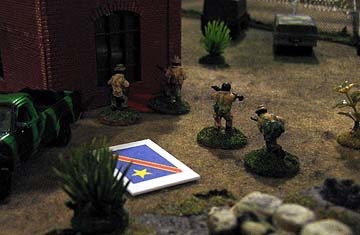 Set in the Congo during the 1960s, this scenario features 5 factions squabbling over a container ship bringing in food and medicine. It is a free-for-all, with the United Nations peacekeeping troops trying to guard the supplies, while two rival military factions and two rebel factions try to take possession of it. Read the full report on Mike Demana’s Lead Legionaries blog. “That’s My USAid: Congo Chaos” is the scenario. The scenario was run twice each on Friday and Saturday, with wildly different results. This free-for-all always involves some wheeling and dealing among the factions. Those factions who try to go it alone often suffer. Read the full report on Mike Demana’s Lead Legionaries blog. 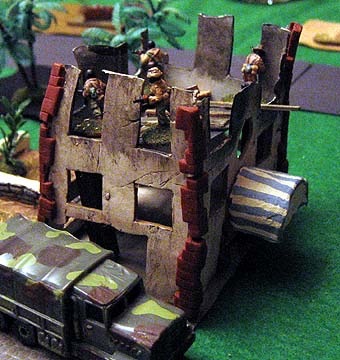 This is a link to an entire blog created to document our first attempt at a campaign using Wars of Insurgency rules. Each player controlled a faction attempting to expand its control and work its tendrils into the capital. They fought non-player government factions run by their opponents, or other players. 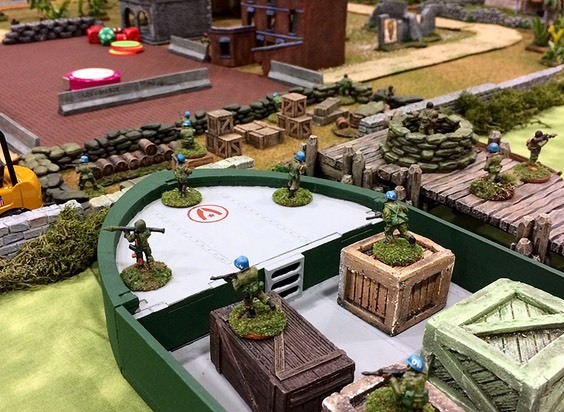 Click on the link to read the campaign’s background and some of the battle reports. In a sendup to the classic song by Warren Zevon, my friend Joel staged a scenario set during the breakdown of the Congo in the 1960s, featuing characters from the song. 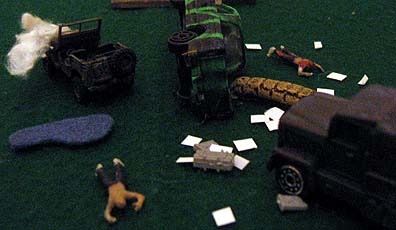 The game opens after the ambush of Roland’s force, with his rival Van Owen and other factions investigating the cargo the convoy was carrying. Read the full report on Mike Demana’s Lead Legionaries blog. The Congolese army, aided by the United Nations, is invading the breakaway province of Katanga in an attempt to end their rebellion. In this six-player scenario, the Katangans were stiffened by a force of mercenaries (as historically) recruited from Belgian, Britain, and other places. Read the full report on Mike Demana’s Lead Legionaries blog. Three rebel factions raid a police compound in Africa, attempting to free political prisoners belonging to their movement. The GM — once again, my friend Joel — played the police attempting to hold off the rebels’ uncoordinated assault. Read the full report on Mike Demana’s Lead Legionaries blog. 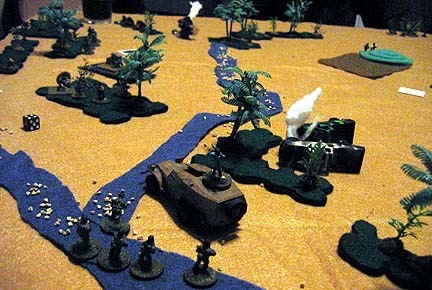 Four players clash in this Wars of Insurgency games with smaller forces. The Minister of the Interior is on his way back from an OPEC meeting when two rebel groups spring an ambush. The convoy guards and a local commander try to battle them off and save the government bigwig from kidnapping or death. Read the full report on Mike Demana’s Lead Legionaries blog. This interesting scenario has two players facing off in a pair of battles played out over two nights. 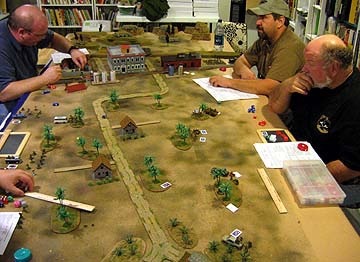 A GM provided players with maps and the mechanized Ethiopians squared off against a mostly foot Islamist Somali militia. 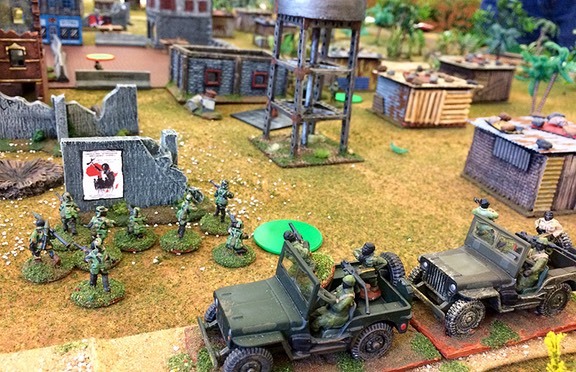 Read the full report on Mike Demana’s Lead Legionaries blog.